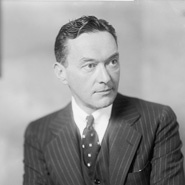 Widely credited with introducing the term "cold war" to refer to relations between the Soviet Union and the West, Walter Lippmann was a journalist, philosopher, and media critic who helped found The New Republic magazine in 1913. He started as a columnist in 1921 with the reformist newspaper New York World, and then moved to the New York Herald-Tribune. There, his long-running column "Today and Tomorrow" won two Pulitzer Prizes. During a long career, Lippmann published seven books and contributed articles to more than 50 magazines.